It’s no secret that my first novel took me a while to write. Okay, YONKS, mainly due to my endless tweaking and re-tweaking of it until it waved the white flag at me. 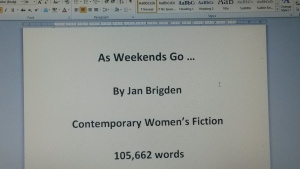 I’m thrilled, therefore, to report that, having received a cracking report from my RNA New Writers’ Scheme reader, I’ve finally started submitting my book to agents. To date, I’ve had four rejections. I have, however, received some very encouraging feedback. I’m under no illusions, and I’m certainly not averse to self-publishing, I simply want to try the traditional route first.